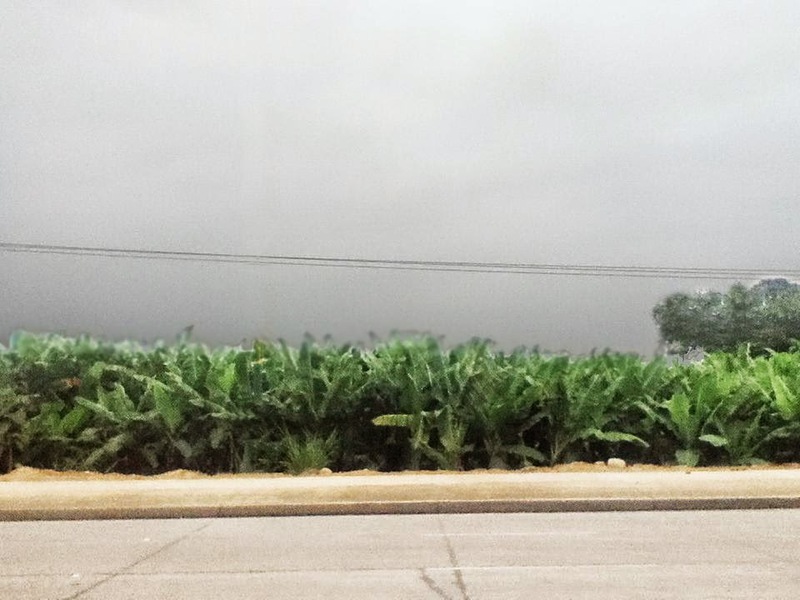 We’re in the south coast of Ecuador: El Oro province is banana-landia, the world capital of commercial banana production. Most of the commercial fields are mono-cropped like this one by the highway. Most use lots of herbicides and pesticides: hazard to workers, burden on the ecosystem. 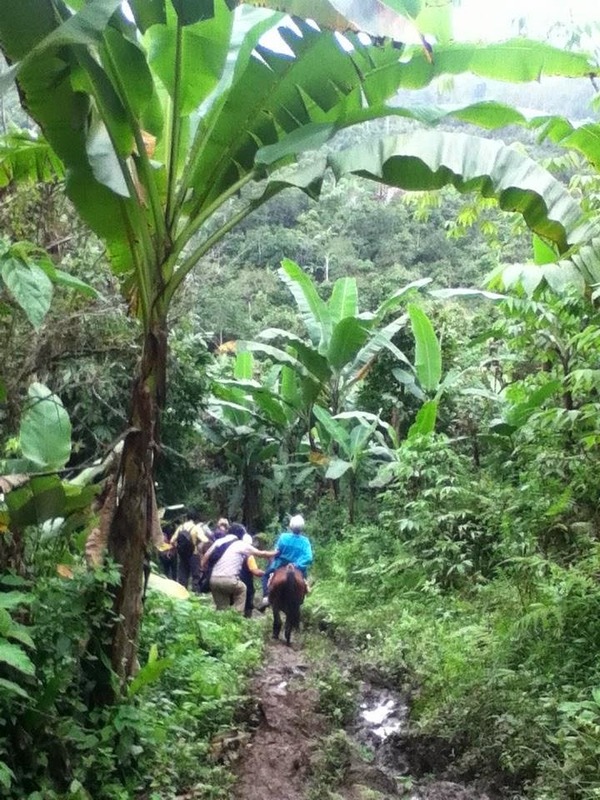 We visited a Heifer Ecuador project in the midst of El Oro province. In 2004, a plucky group of farmers formed a cooperative association, nicknamed AsoGuabo, to market organic, fair-trade bananas. When we visited, Heifer Ecuador was assisting them over the course of several years in several ways: organizational management, technical help with drip irrigation, a grant from which coop members could get micro-loans — oh, and gifted flocks of chickens, in Heifer style, to farming families. Here we make our way through one coop member’s mixed forest inter-planted with banana, the opposite of mono-cropping. 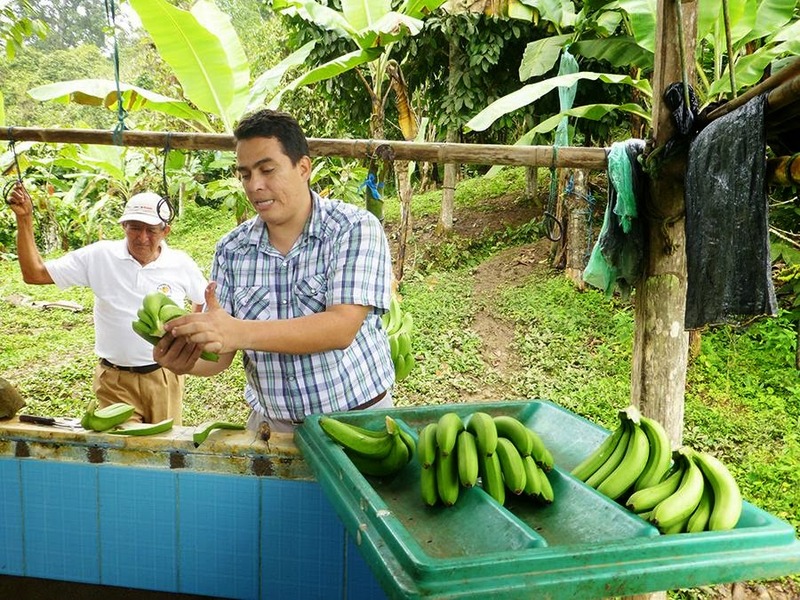 Carlos Cuenca, a farmer member of the coop, and Michael Calle, the coop manager, explain the fine points of processing bananas for the organic market. Besides managing pests, the farmers have to gauge ripeness exactly, trim them just so, float them in a water bath during handling so as to never bruise them, and pack the bananas in boxes weighing exactly 44 lbs. It’s amazing to learn what goes into the bananas that we so casually buy and eat. Although there is no way to buy AsoGuabo bananas at home, we promised ourselves to seek out organic, fair-trade fruit, knowing now what that means to the organic, fair-trade farmers on the growing end of the transaction. Read more about Heifer Ecuador empowering women entrepreneurs in El Oro. 0 Response to "Letters from Ecuador Part 2 - Bananas Organic and Fair Trade"